Acupuncture has been used to treat chronic pain for centuries in China. 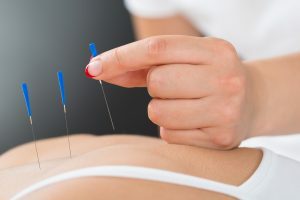 It has always been a mystery to Western medicine as to why sticking tiny needles into the human body, at certain points and twisting them, helps to relieve pain. However, a new study offers answers. The recent study from LA BioMed researchers have found that the proper use of acupuncture (with the reinforcement method or coupled with heat, which is often used in acupuncture treatments) can lead to elevated levels of nitric oxide in the skin at the acupoints (where the needles are inserted and manipulated). They also noted that nitric oxide increases blood flow, encouraging the release of analgesic or sensitising substances, which causes the skin to feel warmer and contributes to the beneficial effects of the therapies. Researchers used a low force and rate/reinforcement method of acupuncture. Gently inserting acupuncture needles into the skin of 25 women and men aged between 18-60.They softly twisted the needles for 2 minutes or until they achieved a sensation of dequi (soreness, numbness, pain). They manipulated the needles using gentle amplitude and moderate speed for 2 minutes every 5 minutes for a total of 20 minutes. Electrical heat was applied for 20 minutes and researchers found elevated levels of nitric oxide at the acupoints. The test was conducted with high frequency and force, which is known as a reduction method and found nitric oxide levels over the areas of the skin region were reduced. Researchers will continue to explore these 2 techniques to better determine the effectiveness of each in understanding pain relief and the cellular and molecular mechanisms involved. The study was carried out in the biomedical research facilities of the Los Angeles Biomedical Research Institute at Harbor-UCLA Medical Center and was published in Evidence-based Complementary and Alternative Medicine. Author and contributor Sheng-Xing Ma. If you would like more information on acupuncture & how it could help you please don’t hesitate to contact us.